I got the wreath for $4 on sale at Michael’s but you can find a smaller wreath and accessories all at the Dollar Tree as well to make this less expensive. The first step if to fluff your wreath out if it is still flat. After that. secure the bow somewhere close to the middle of the bottom of your wreath (I do not have a good eye for this stuff but I think I got as close to center as I could!). Simply hot glue OR use the wire to tie your bow in place. I then traced the outline of my evil eye and used the first eyeball as a template for my second eye. Color them yellow – or red, or blue! Whatever evil eye color resonates with you. I started to cut spooky fangs from the white poster board in various sizes and shapes for a snarled look. Once dry, you’re ready to haunt your halls! 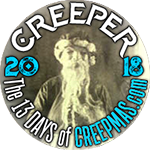 Next Next post: 13 Days of Creepmas!